Crustal Deformation in the Southcentral Alaska Subduction Zone (S.C. Cohen, J.T. Freymueller). Tectonic, geologic, and seismologic setting. Observed crustal motion. 3.1. Coseismic crustal motion. 3.2. Preseismic and interseismic (pre-1964) crustal motion. 3.3. Postseismic and interseismic (post-1964) crustal motion. 3.4. Multidecadal postseismic uplift deduced from comparisons of GPS and leveling observations. 3.5. Contemporary GPS observations of crustal motion: spatial and temporal variability. Models of Southcentral Alaska preseismic and postseismic crustal deformation. Summary. Acknowledgements. References. Relating Fault Mechanics to Fault Zone Structure (R.L. Biegel, C.G. Sammis). The structure of mature, large displacement strike-slip faults. 3.1. The punchbowl and San Gabriel faults in Southern California. 3.2. The idealized punchbowl model. 3.3. The Nojima fault, Japan. 3.4. The Median tectonic line, Japan. 3.5. The Carboneras fault, Southeastern Spain). The structure of mature, large displacement dip-slip faults. 4.1. The badwater turtleback normal faults, Death Valley, CA. 4.2. The chelungpu fault, Taiwan. Formation of fault zone structure. 5.1. Fault zone formation in low porosity jointed rock. 5.2. Fault zone formation in high porosity sandstones. 5.3. Fractal fragmentation and shear localization. 5.4. Fragmentation and off-fault damage in the process zone of large earthquakes. 5.5. Wear. 5.6. Pseudotachylytes. Effects of fault zone structure on dynamic rupture. 6.1. Effects of fault zone structure on the nucleation of an earthquake. 6.2. Effect of fault zone structure on the propagation of an earthquake rupture. 6.3. Effect of fault zone structure on the arrest of an earthquake rupture. Discussion. Acknowledgements. References. Past Surface Temperature Changes as Derived from ontinental Temperature Logs - Canadian and Some Global Examples of Application of a New Tool in Climate Change Studies (J. Majorowicz, J. Safanda, W. Skinner). Basic features of ground surface temperature reconstruction. Heat gain by the earth due to climatic warming. Alternative approach - determining the pre-observational mean level. Case studies demonstrating the basic features of the inversion method. Case studies demonstrating the basic features of the "POM" approach. Hemispheric and continental reconstructions of GST from well temperatures. Comparison of well temperature derived GST histories with observations and other proxy climate information. Conclusions. Acknowledgements. References. Instability and Structural Failure at Volcanic Ocean Islands and the Climate Change Dimension (B.H. Keating, W.J. McGuire). Introduction. 1.1. Volcanic edifice instability. Factors and mechanisms affecting instability and failure at volcanic ocean islands. 2.1. The role of intra-edifice water. 2.2. The dike injection process. 2.3. Rock type. 2.4. Rheology. 2.5. Rock density. 2.6. Landslide structural characteristics and depth of initiation. 2.7. Landslide form and dimensions. 2.8. Slope angle (bathymetry). 2.9. Dynamics. 2.10. Change in pore properties associated with liquefaction. Post-failure debris movement. 3.1. A review of transport mechanisms. 3.2. Submarine mass movement classification, terminology, and facies concepts. 3.3. Runout. Transport. 4.1. Overview of laboratory experiments. 4.2. Sonar surveys. 4.3. Seismic surveys. Landslides as tsunami generators. 5.1. Introduction and recent research trends. 5.2. Hypothetical events. 5.3. Quantification. 5.4. New areas of tsunami research. Climate change and landslides in ocean basin environments. 6.1. Climate change as a landslide trigger. 6.2. Gas hydrates. 6.3. Canary Islands. 6.4. The Hawaiian islands and climate change. 6.5. Age dating correlations. 6.6. Arguments for climate correlations: rainfall and landslides. The critically acclaimed serialized review journal for nearly fifty years, Advances in Geophysics is a highly respected publication in the field of geophysics. Since 1952, each volume has been eagerly awaited, frequently consulted, and praised by researchers and reviewers alike. 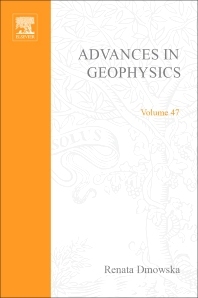 Now with over 45 volumes, the Serial contains much material still relevant today-truly an essential publication for researchers in all fields of geophysics. Earth scientists, geophysicists, academic and institute libraries.